Liberal Leader Stephen McNeil squints into the sunlight on Sunday afternoon at Seaview Memorial Park in Halifax. Glancing down at his speech on the podium, he purses his lips towards three thin black microphones, preparing to speak. “A Liberal government will recognize the memory and spirit of Africville by restoring the Seaview Baptist Church and by creating an interpretive centre on the site,” McNeil reads. Irvine Carvery, watching nearby from behind the cameras, has heard it all before. Politicians have promised to help the Africville Genealogy Society President so many times that when he tries to recall specific dates, or even years, he can’t be sure. McNeil came late to Carvery’s long awaited project: the resurrection of his community’s church. When Nova Scotia’s provincial election was called for June 9, Carvery acted quickly. He garnered the support of the province’s New Democrats first and the Conservatives soon after. The former Africville resident does not endorse any of the three parties. So when the Liberal Leader spouted his vow of $2.2 million over four years, Carvery thought: “show me”. Carvery is 57 years young – a born optimist, he often says. The wrinkles on the outside corners of his eyes are the topographical evidence of how often he smiles. But when asked to describe the City of Halifax’s actions in the 1960s toward the village where he grew up, the corners of Carvery’s mouth turn down. Back in the early 1960s, his community was considered a black ghetto and a blight besmirching the great City of Halifax; at least, those were the words that appeared abundantly in newspapers at the time. This mentality, mixed with then popular ideas of “social integration” and “urban renewal”, provided the catalyst for the municipal government to eradicate the villagers’ homes, businesses and church. City workers bulldozed the 130-year-old Baptist church without warning one night in 1967. Once, the church was a popular gathering place that overflowed on Christmas so that many worshipers had to pray outside. Over Easter weekend every year, black and white people united in the basement along pews that sat 150 people. Carvery talked at length about his Africville memories, but one of his favourite stories to tell happened years after the relocation project, at Mount Saint Vincent University in 1989. Gus Wedderburn co-Chaired Halifax’s Human Rights Advisory Committee during the 1960s. He recommended the City should relocate the villagers. Though he didn’t consult Africville residents, he honestly believed it was the right move. During a conference as part of the exhibit, someone asked Wedderburn why he made the decision. 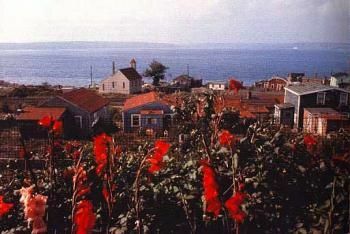 He held up the cover of a book called “Remember Africville” that showed a garden of red blossoms in the sunshine with village houses in the background. Carvery hopes to re-grow those metaphorical flowers in the diluted community by rebuilding the church. He’s hoped for years. The champion for Africville was 53 in July 2005 when he attended the 23rd annual Africville reunion at Seaview Park under the shelter of a circular white tent. “Genealogy Society President Irvine Carvery said his group is now putting together a business plan for the new church, which could be under construction by spring 2006,” The Daily News reported. But some community members said they were fearful that original Africville residents would not see the church completed within their lifetimes. “We’ll hold out guarded optimism,” Carvery told reporters. Carvery was 50 in July 2002 when he sang O Canada during a ceremony at Seaview Memorial Park. Sheila Copps declared the park a national historic site that summer day and unveiled a dorsal fin shaped memorial plaque. She announced that all three levels of government had met to discuss rebuilding the Seaview Baptist Church. She promised “more than symbolic support in the future,” The Chronicle Herald reported. The Genealogy Society President told the media he hoped an agreement could be reached by fall 2002. Carvery was 45 in 1996 when City officials arrived at Seaview Memorial Park in the spring to survey the site in preparation for church construction. On April 4 that year, he lead the Genealogy Society to file a 13-page lawsuit against the City of Halifax demanding fair compensation, an apology and reconstruction of the demolished church. The city responded with a “demand for particulars” asking former Africville residents to prove they were wronged. A noticeably less optimistic Carvery had just celebrated his 44th birthday in September 1995 when The North End News reported he was frustrated by “foot dragging” at all levels of government. The paper reported that Supply and Services Minister Wayne Adams had already promised to contribute $200,000 to the project. Carvery said he anticipated “no problems” with the City of Halifax. In February 1992 he was 41 when he told the North End News that the Africville community could expect to see their church resurrected by the spring of 1993. Carvery had already spoken to an architect. The mayor of the day endorsed the project and Carvery “found the province surprisingly agreeable,” reporter Shaune MacKinlay wrote. Later that year, Martin Luther King III attended a ground breaking ceremony at Seaview Memorial Park. In 1991 –17 years before he watched Stephen McNeil announce the Liberal Party’s funding plans – Carvery was 40. That year he watched Deputy Premier Tom McInnis announce that a replica of the Seaview Baptist Church would be built. On July 27, 1987, the former residents of Africville, their children and grandchildren, sought shelter from the rain under a green canvas tent during the community’s reunion festivities at Seaview Park. Carvery, 36, braved the storm. It was 1967 and Carvery was 13 when the city forced his family to move out of his home in Africville. Now Carvery says he hopes to see an agreement in place about the church and interpretive centre by Christmas. In another two years, he says, the church should be standing in Seaview Park. But he knows that doesn’t mean it will be. Submitted by Hillary on Fri, 06/05/2009 - 14:05. Great to see an article that puts politicians' promises in context rather than just recording election rhetoric. The disrespect shown (over and over again) to residents and descendants of Africville is appalling. Submitted by Fellow Worker Mark on Sat, 06/06/2009 - 10:24.
what an awesome job writing this story. I wish there were more stories written with this layout. as Utah Phillips always said, "the long memory is the most radical thing in (Canada)" Great job! Submitted by Bruce Wark on Mon, 06/08/2009 - 13:22. I've followed stories about the work of Irvine Carvery and the Africville Geneology Society for years, but had somehow forgotten how many times political promises were made, then broken. This article makes it plain that Carvery is right to keep his fingers crossed.